Probiotics in yogurt and supplements, advocates say, restore the balance of bacteria in the intestines and promote good health, but newly published UO research raises questions about what dosage and which microbes should be used to keep the immune system in balance. Using zebrafish, a UO team led by postdoctoral researcher Annah S. Rolig of the Institute of Molecular Biology has redefined how scientists view bacteria interactions in the guts of zebrafish. The findings, albeit indirectly, could translate to building more effective uses of probiotics. The research, published this week in the high-profile journal Cell Host & Microbe, turns upside down a long-held assumption that the abundance of bacteria in the gut determines what's happening there. In fact, Rolig says, her team has found that very low levels of certain bacterial species may be essential. In the study, Rolig used isolates of bacterial species naturally found in zebrafish intestines, but she inserted them separately or in combination in fish raised completely germ free — each fish used had no bacteria in its gut at the start of each experiment. It was discovered that a species that made up only 10 percent of the bacterial population completely dictated immune response, even in the presence of a bacteria that alone in another fish had triggered a major inflammatory reaction. Low counts of a bacterial species have been discounted in importance in most scientific circles till now, but slight shifts in the ratios of more-abundant microbe populations have been thought to have significant roles in obesity, diabetes and inflammatory bowel diseases such as Crohn’s disease. UO physicist Raghuveer Parthasarathy, a co-author on the paper, developed a math-driven model that provides formulas that help scientists predict the collective inflammatory responses of combinations of bacteria. Someday, Rolig says, it may be possible to refine just what probiotic best meets the specific needs of a patient facing a heritable disease or another health issue linked to intestinal health. The project was done under the auspices of the National Institutes of Health-funded META Center for Systems Biology at the UO. Karen Guillemin, the center's director, says the findings fill one of the center's goals. 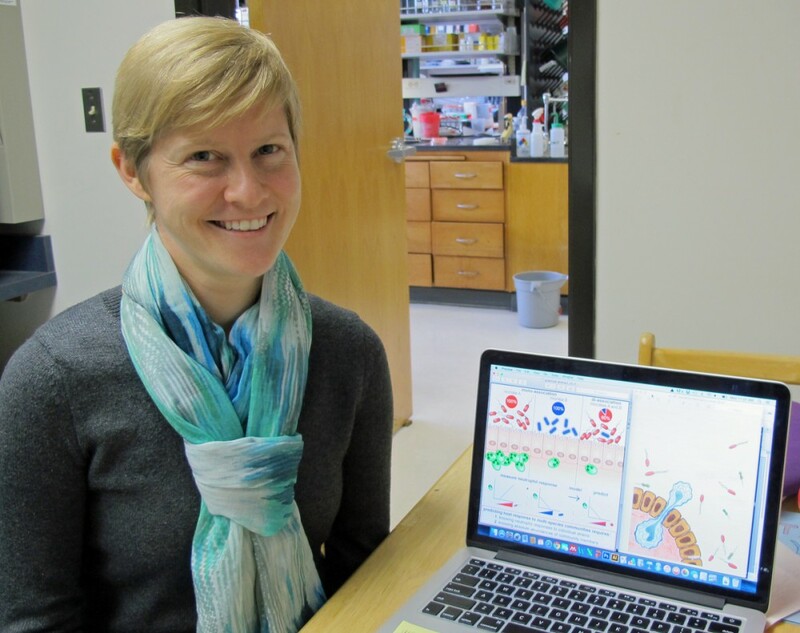 "In Annah’s beautiful experimental work and Raghu’s elegant mathematical modeling, informed by Brendan Bohannan’s insights into ecological systems, we’ve accomplished this goal by providing a predictive model of the host inflammatory response to a community of bacteria based on knowledge of the responses to individual members," Guillemin said. UO biology graduate student Adam R. Burns also was a co-author on the paper. More in-depth details about the research are in a science news release.